It’s hard to believe we just rung in a new year. As we prepare for the months ahead, January is a good time to reflect on the successes and missteps of the past year – and we saw a lot of both in 2014. We’ve seen rapid growth in cloud services over the past year – to the tune of $56.6 billion, according to research from IDC. And while growth is great, it has introduced a few troublesome trends in 2014; namely too many apps, too much access and too many poor password practices. Writing for Entrepreneur, Intermedia President Mike Gold examined the headlines that made waves in 2014 and identified some of the challenges ahead for small and medium-sized businesses in 2015. Extremely high reliability will no longer be a luxury. According to Intuit, 37 percent of SMBs are already fully cloud adopted. For any business that relies on the cloud for mission-critical services, the classic 99.9 percent uptime guarantee is no longer enough—not when that amounts to 8 hours of downtime a year. Look for 99.999 percent uptime (which promises less than 26 seconds of downtime a month) to be the new standard. The cost of litigation will make compliant archiving the new norm. Most businesses associate compliant archiving with HIPAA and SOX. But expect archiving to become essential for all businesses, not just regulated businesses. That’s because compliant archiving slashes the mounting burden of eDiscovery (a 2014 report by eDiscovery.com found an average of 479 GB collected in eDiscovery projects prior to filtering and processing). This isn’t just email archiving, though—chat transcripts, too, for example, will also need to be archived to protect your company. Businesses will begin to take the ex-employee menace seriously. In September, the FBI warned that “disgruntled and former employees pose a significant cyber threat to US businesses.” The question is: will businesses institute rigorous access auditing and offboarding policies before the inevitable headline-grabbing hack? 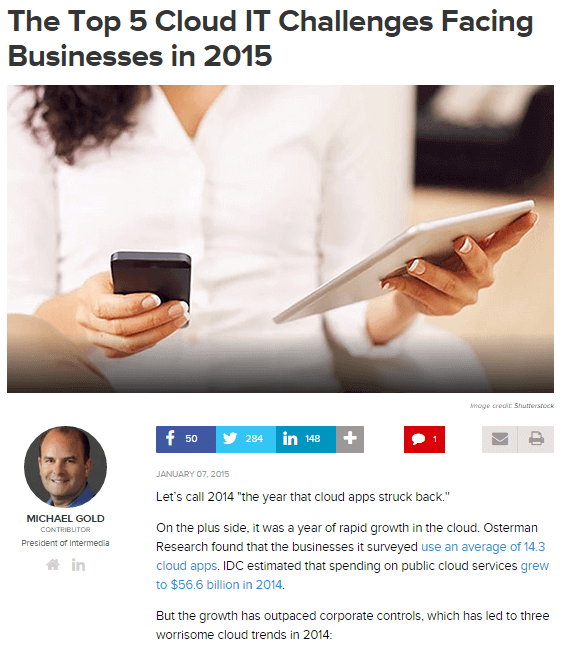 Read Mike Gold’s article on Entrepreneur to learn about the other trends impacting businesses in 2015. Intermedia's 2015 Small & Medium Businesses Mobile Trends Report is here!